CAUTION: This is Not a Level Playing Field! 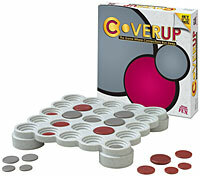 COVERUPâ„¢ is a four-in-a-row game with depthâ€”three depths to be exact. Players choose where they will place their disks, and at what depth. Place a disk below the surface and risk having that disk covered up. Move a disk and risk uncovering an opponentâ€™s disk. This deceptive two-player strategy game takes only seconds to learn and minutes to play. Reach New Levels with COVERUP!